A couple of times a year, I go on photo expeditions with my painting buddy Sue to collect painting references. 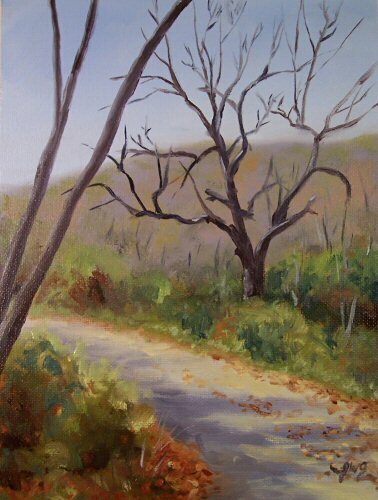 I painted this from one of the photos I took at Muscoot Farm. 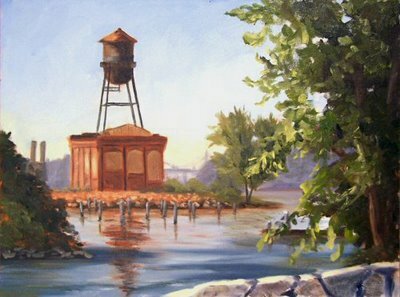 I love painting there en plein air, but since they don’t open until 10, it’s hard to catch the light and shadow on location before the sun is directly overhead. This beautiful path winds around behind the fields, with old trees and huge rock outcroppings. 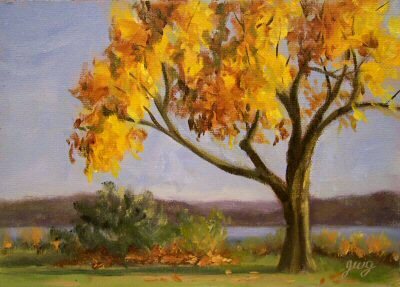 This was painted with a limited palette of cadmium yellow lemon, venetian red, burnt sienna, and ultramarine blue, plus white. This is one of my favorite landscape palettes when I don’t need a bright red or strong violet. It yields nice greens and earth tones, and a lovely soft violet. This little gem is just off my easel. My tiny paintings, which I fondly refer to as “Jamie’s Jewels”, make ideal holiday gifts. You can commission a favorite scene, or choose one of the unsold miniatures already available. They are only $100 and come gift-boxed. Take a look at some of them by clicking here and then scrolling down the page beyond this post. You’ll see that they can be either on tiny, unframed, gallery-wrapped stretched canvases, or I can paint these postage stamp size minis and put them in beautiful gold frames. I ship them in gold gift boxes with gold ribbons, so they are ready to put under your tree or in Somebody Special’s Christmas stocking. 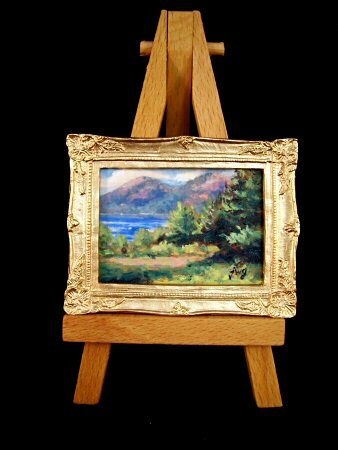 They can be prepared to be hung on a wall, or set on a miniature easel like this one. Surprise a loved one this holiday season with a creative gift from the heart! 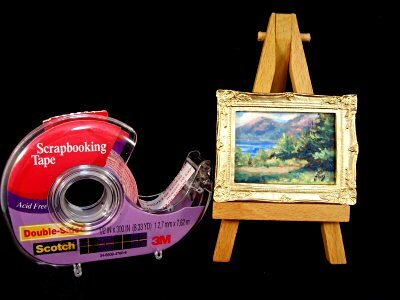 I took a photo of this painting with a tape dispenser so that you can better see the scale of this tiny work. The paintings are done under a magnification lamp with very small brushes, and actually take longer to do than paintings many times the size. Plus, they come beautifully framed! Time for a few chuckles…. I’m working on finishing up a commissioned painting today, and don’t know if it will be done in time to post it here for today’s painting. So, I thought instead, I’d provide this link for you to click on for your entertainment. Now you’ll all know what plein air painters really face when we head out on location! Be sure you have your computer speakers turned on to experience the full effect! 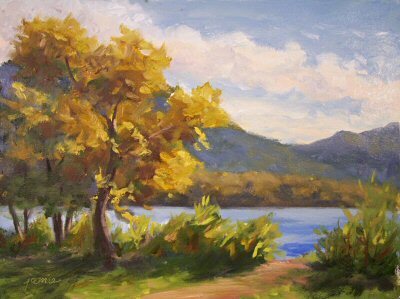 This painting was done on location at Peach Lake in the Hudson Valley of New York State. All of these objects were “white”, but had leanings toward different colors. 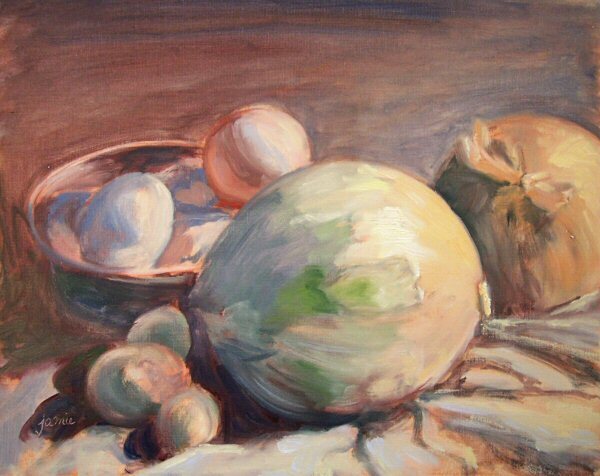 I pushed the colors and values of the different subjects, and varied edges and contrast to make my focal point. 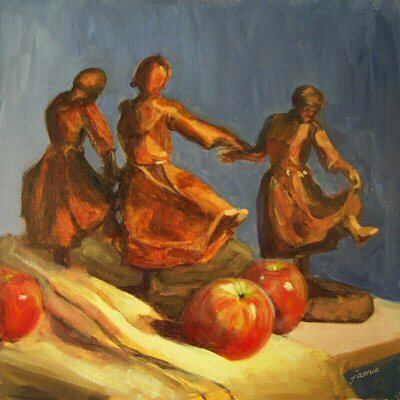 I don’t paint still lifes very often this time of year, but the Three Muses and apples were hard to resist! Isn’t it interesting that during Halloween month, Black and Orange led the pack? I’ll be putting up a new poll this evening. Many thanks to all the participants!